We gathered at WCA at 5:30 on Friday evening making a quick load up of bikes and gear. We made our way to Ft. Yargo State Park for camping, mountain biking and a good time. We got some practice setting up tents in the dark, starting campfires and braving the chilly night time weather. Saturday morning was overcast and cool, but after some great breakfast meals of grits, eggs, and sausage we were ready for the day. The scrambled eggs were legitimately the best eggs I think we have ever had on a trip. Two groups set out from camp for mountain bike riding of either a short or long course. Both groups had a good time and either covered 12 miles or 7 miles around the lake of Ft Yargo. While one group was biking, the base camp crew was learning some basics of Scout camping such as orienteering, fire building and just having a good time camping. The Ft. Yargo pioneering campground was big, allowing us to spread out and enjoy the shelters, fire pits and open camping area. The weather cooperated all day Saturday and warmed up by lunch. 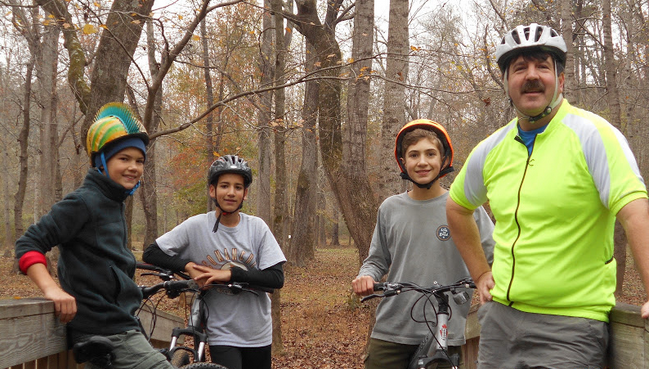 After lunch, some Scouts were adventurous enough to go back out for another round of biking. The trails offered both some technical riding and some scenic riding and were given good reviews by the Scouts and adults, alike. As the sun went down, the Scouts prepared another good meal for dinner. One group had burritos while the other group opted for hamburger helper. Both meals got positive reviews from their patrols. After dinner, we gathered around the campfire and talked about the day and our roses, thorns, and buds. A tired group of scouts made it back to their tents fairly early. Overnight, the rain and wind made some noise but then it cleared up and cooled down. Sunday morning was chilly and the campfire was a priority to help warm up. It gave us a chance to talk about dressing for the weather and being prepared for different weather possibilities. Breakfast was good, but cereal and milk didn’t help with the temperatures. The Scouts were good sports though and completed some more advancement requirements including swinging an axe and hatchet. At the end, Adam T was recognized for advancing to the rank of Life! Big thanks to the adults who helped with transportation, biking, and working with the Scouts. Thanks to Dave M for transporting the trailer. Overall, it was a good trip with lots of advancement, activity, friendship, and fun! This entry was posted in Trip Report. Bookmark the permalink.